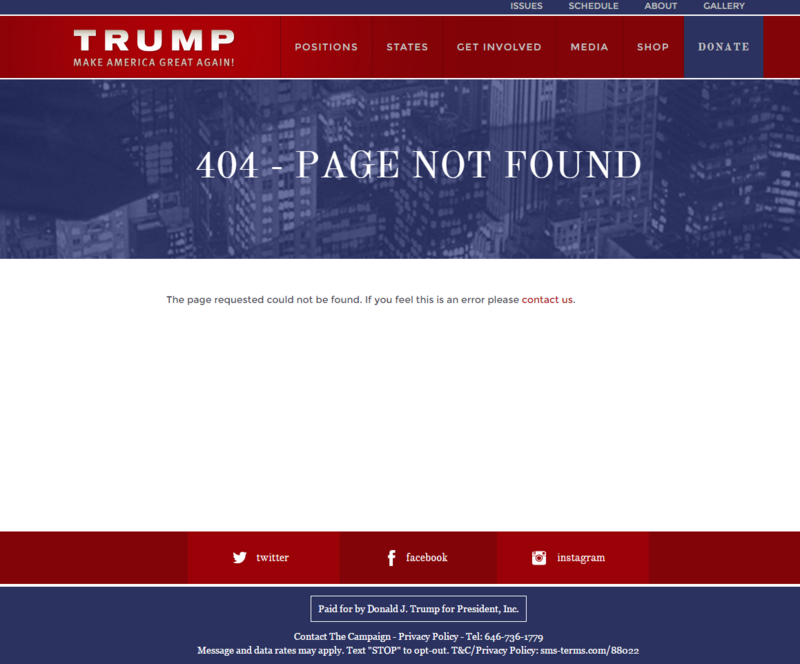 The election season is long but many of this year’s presidential candidates have given us something to laugh about — ridiculous 404 error pages. Tech companies have mastered the art of a disarming us when sites crash or pages fail to load. What would the world have been without Twitter’s, now-deceased, fail whale? The trick to a good 404 page is that it is fun, creates an emotional stopgap during a site’s downtime and prevents angry emails about a loading error. The best will make you laugh out load and the worst will lead to mini customer services crises. 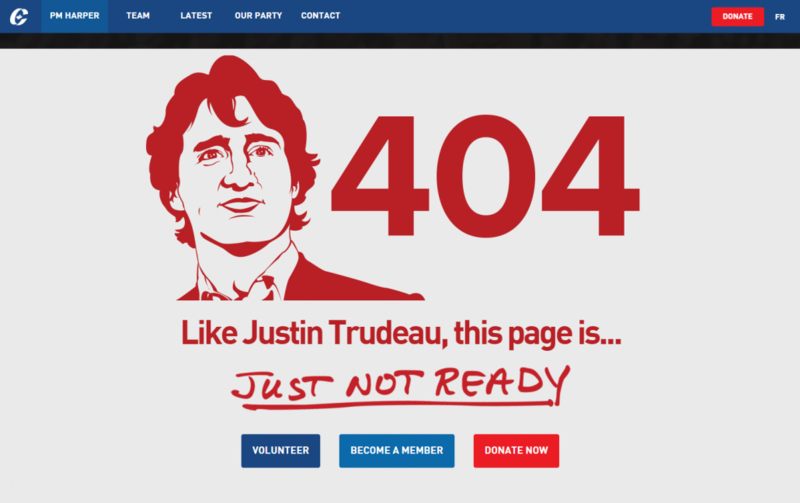 During Canada’s 2015 Election, campaign 404 pages were used by prime ministerial candidates to attack their opponents. Some did so comically, such as then conservative leader Stephen Harper’s page labeling the now Prime Minister Justin Trudeau as not quite ready. 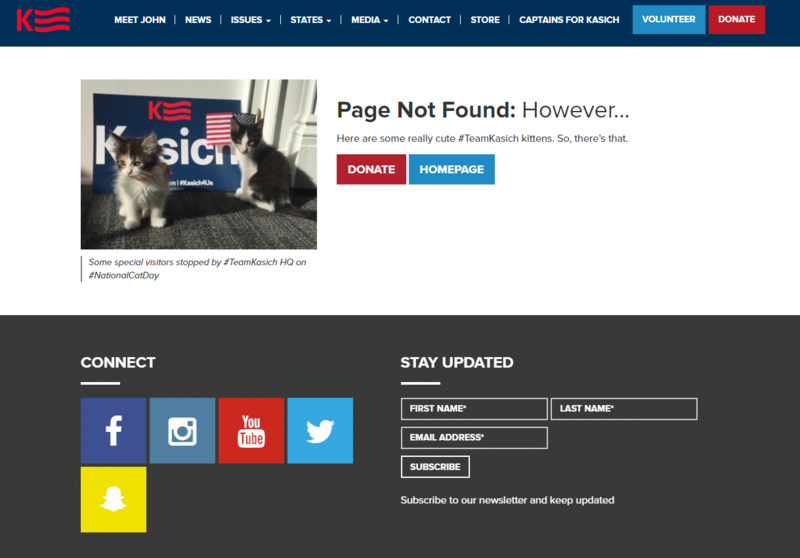 This year’s crop of U.S. presidential campaign 404 pages is no-less outrageous. 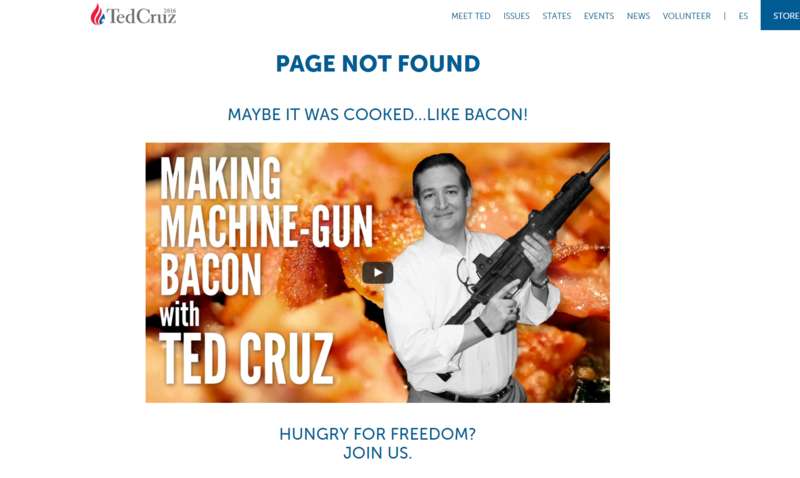 Ted Cruz’s page is unhinged featuring the Texas Senator cooking bacon on the smoking hot barrel of a machine gun. It cooks, he eats it and he shoots a target. What could possibly go wrong? The video is shot like an episode of Man vs. Food, with a casual and energetic style, but shows the creativity his the campaign team invested in their online strategy. 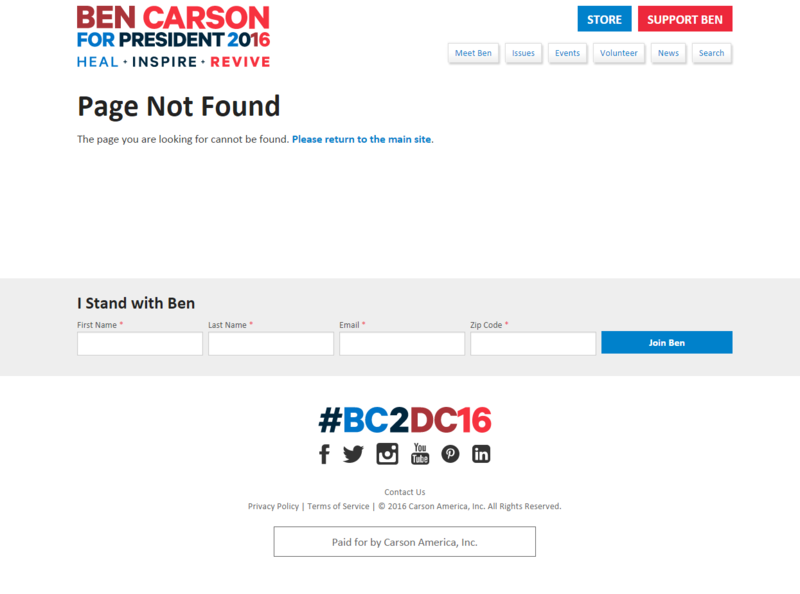 On the flipside, Ben Carson’s page is barren. His camp took a more functional perspective, albeit less creative, with a sticky footer collecting supporter contact information. 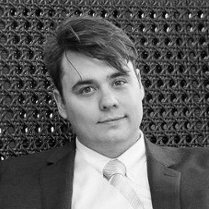 His campaign is funded by small donors and an email signup, a low barrier of entry to engage on a campaign, has been highly effective for the candidate helping him generate as much as $10 million in a single-quarter last year. Along the same vein, though with a little more styling, is Donald Trump’s page. As 404 pages go, one might steal a phrase from the billionaire and go as far as to say, “It’s a loser.” The rest of the site is used as an e-commerce platform selling such items like Trump’s recognizable red hats for $25 a piece. In fact, by February 1, he’d spent $500,000 to produce them and at times they’ve sold out. This has also created its own bootleg market on Amazon with the Make America Great Again hats selling for as low as $8.99. 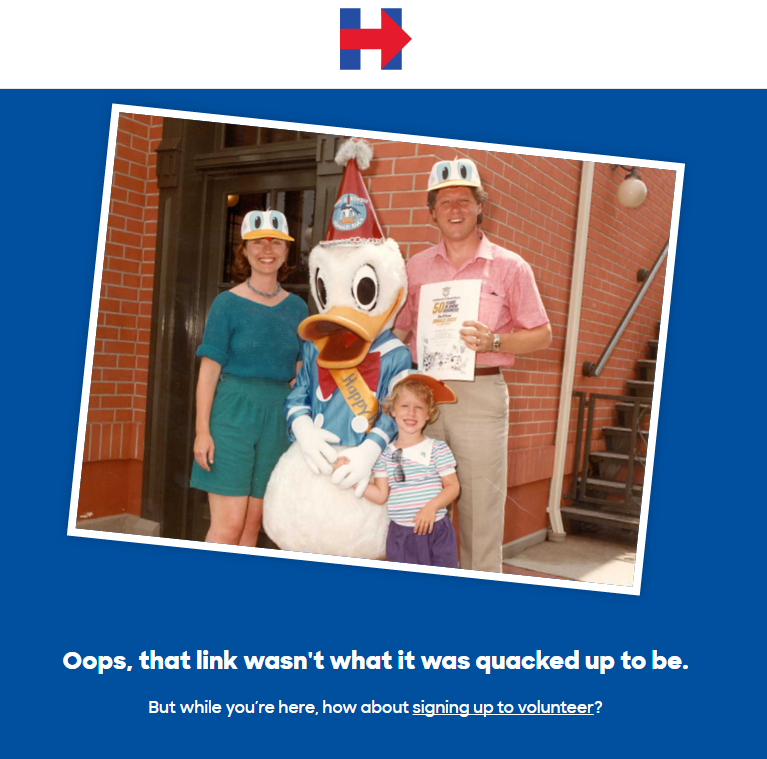 Meanwhile Former Secretary of State Hillary Clinton’s page includes a #ThrowackThursday-worthy photo of her, President Clinton, their daughter Chelsea and Donald Duck. The Huffington Post gushed and said this page is perfect. You be the judge. 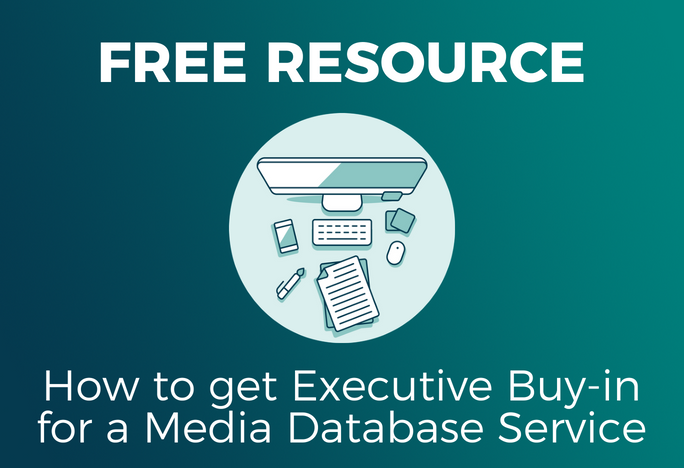 Video is one of the most effective conversion mechanisms when convincing people to fill out a form online. 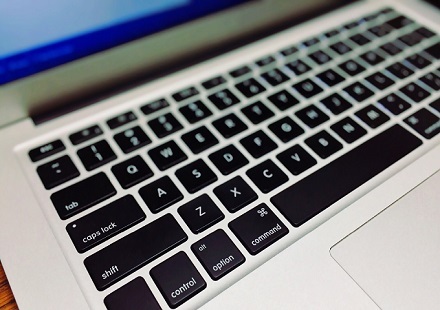 A study by EyeViewEyeStudio found video helped increase landing page conversion by as much as 80 percent. It is no wonder that Ted Cruz cooked bacon or that Bernie Sanders and Marco Rubio turned to moving pictures for their 404 pages. 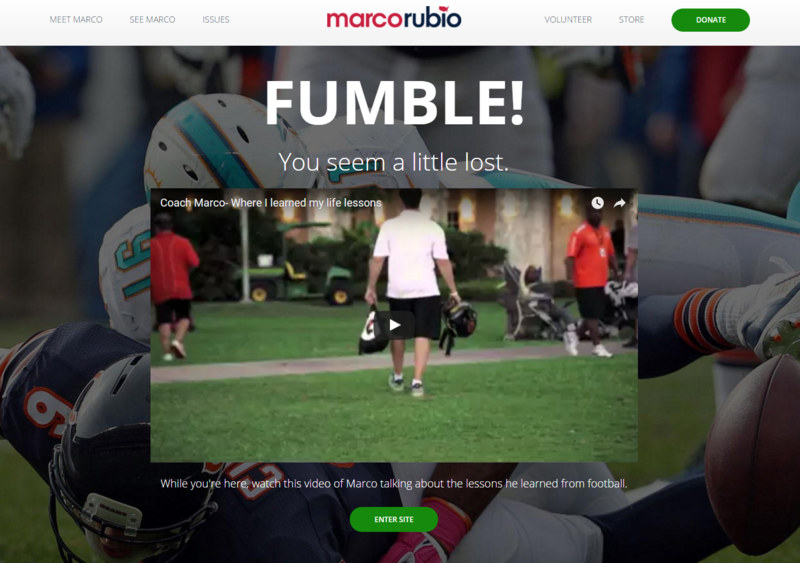 Marco Rubio’s page features the headline FUMBLE and a video of Rubio’s experience as a football coach. The video showcases him in a position of authority working with children and showcasing his love of the game and leadership. While Chris Christie is out of the race, his 404 page lives on featuring his segment, Dad Dancing on Jimmy Fallon. Bernie Sanders’ site hostsan 18 second video in which he describes how to find the sitemap at the bottom of the page. 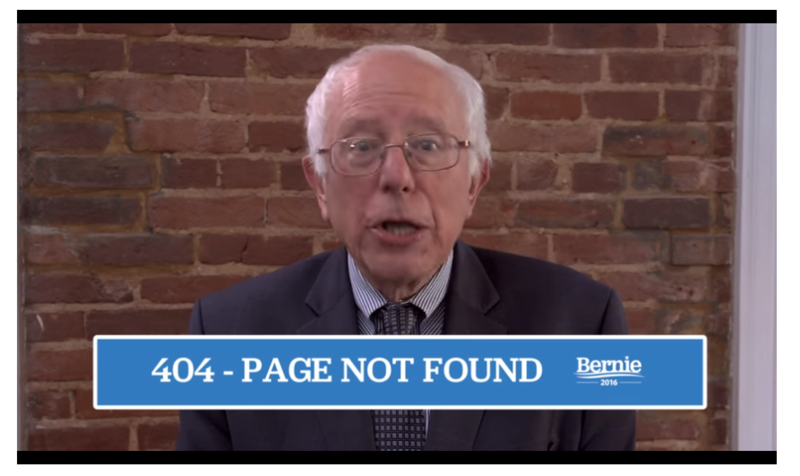 In the video Sanders asks lost page viewers to “scoot down” to find where they want to go while gesturing the action with his hand for those who may be distracted by the creativity of his page. It is almost impossible not to listen.